Today I nearly got run over by a train when on my bike. When I heard the blast just next to me, a searing pain shot through my head and my legs turned to jelly. I immediately backtracked and got out of its way. Then I burst into tears. Now how could this happen, you may well ask. 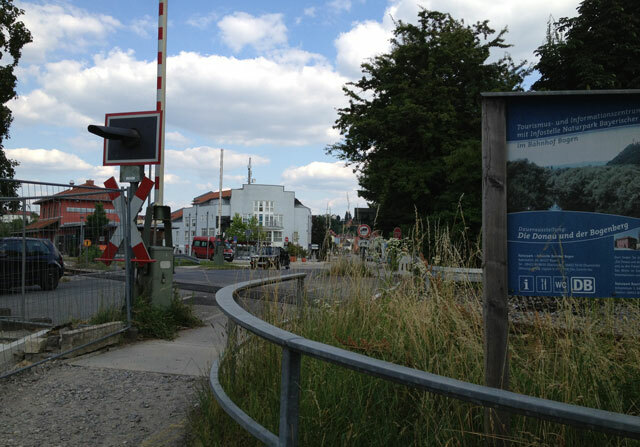 It’s because level crossings in Germany don’t always have boom gates and when they do, they don’t necessarily extend to bike and pedestrian paths. 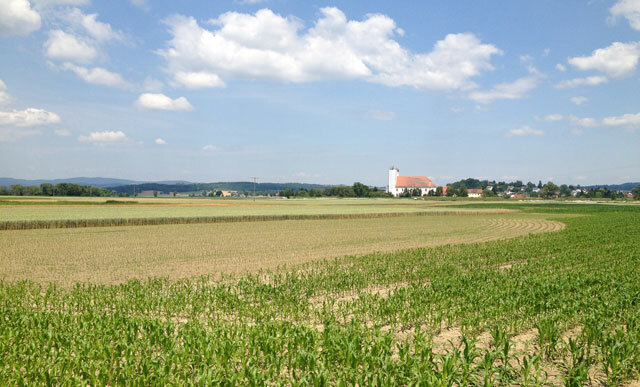 I was a little sluggish this morning when we set out on our bikes from Riebersdorf near Straubing and had trouble keeping up with Jean Michel. He got to the level crossing in Bogen before me and crossed the tracks, without noticing the flashing red light over to the left. 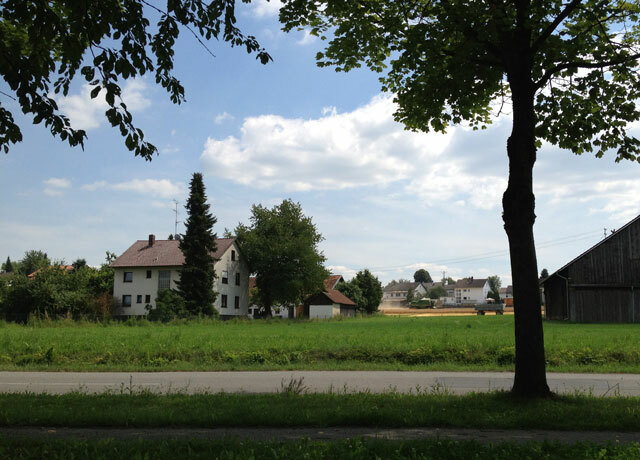 When I rounded the corner of the bike path and saw him across the tracks, I didn’t even look to see if there was a train – there are a lot of disused train tracks in this part of Germany – and followed him. That was when I heard the blast. I looked right and saw the train coming along the track VERY FAST. I have never been so frightened in my life. After a near accident that you have successfully avoided, the important thing is to remember that it didn’t happen and not imagine the consequences. We went to a pharmacy to get some aspirin to relieve my horrendous headache which gave me something practical to do. I don’t know what the girl in the pharmacy thought was wrong, but she discreetly gave me a packet of tissues which I thought was very sweet of her. The pharmacy also had a water distributor and paper cups which is very civilised. By then I had calmed down and could get on my bike again but it was not our most successful day. There are usually gasthofs all along the Danube, but the few we found were all closed on Monday, including the radler freundlisch one which I didn’t think was very cyclist-friendly at all! What’s more, we hardly ever saw the Danube, just fields of crops. We hoped that Mariaposching, the village from which the ferry was to take us across the Danube might have something open, but all I saw were a couple of radler zimmer signs (rooms for cyclists) which weren’t much use. However, we got to the ferry just in time so at least we didn’t have to wait around in the boiling sun. It was the most rudimentary ferry we’ve seen so far – and the cheapest at 3 euros for us and our bikes. Stephans-posching on the other side was much bigger but nothing was open there either so since it was 3 pm by then, we sat on a shady bench with a harvesting machine droning opposite and ate all our emergency biscuits. 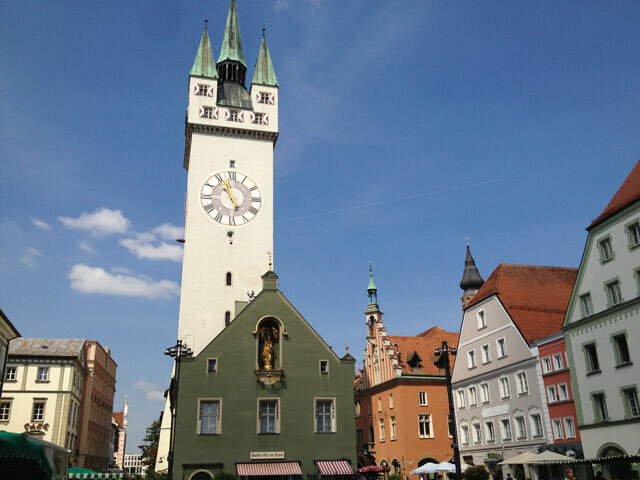 An hour later, having ridden along a very busy road and over a very long bridge whose bike/pedestrian section was closed for some unknown reason, we were back in Bogen where all we could find to eat was a cheese and tomato sandwich and an ice-cream sunday. At least the ice-cream was good and the chairs had padded seats because 50 kilometers of flat paths without a proper lunch break take their toll. Now it’s 8 pm and we’re waiting for our Rheingraf feinherb riesling 2009 bought in Straubing this morning to be cold enough to drink. 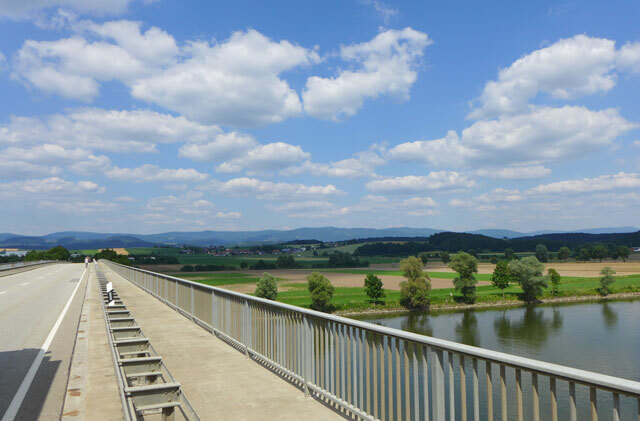 This entry was posted in Cycling, Germany and tagged cycling, danube, ferry at Maria-poschling, level crossings in Germany. Bookmark the permalink. 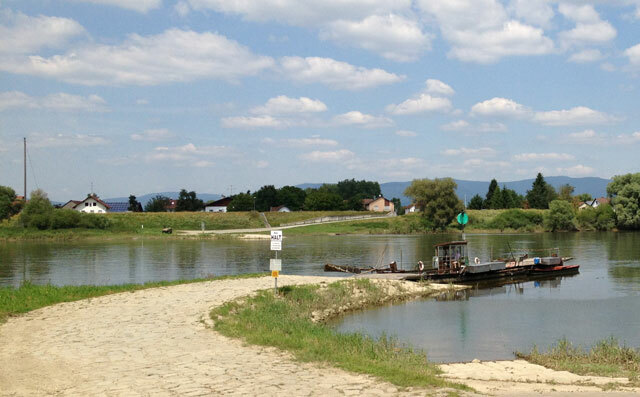 42 Responses to Cycling along the Danube – Watch out for trains! Holy cow Rosemary! That was scary!! Thank goodness you are OK. Thanks Susan! I’ll certainly be watching out for trains from now on. So glad to hear you’re ok, hope today is a much better one since the rest rest of the day sounds as if it wasn’t one of your most enjoyable. Astonishing photos over the last couple of days. I wonder if I enjoy them so much because they are so different from most places I’ve ever been to. I remember going to Hawaii and, as a friend had warned, we weren’t terribly excited because it was so much like tropical North Queensland…but the Victorians who were with us were wowed by it. I know what you mean. 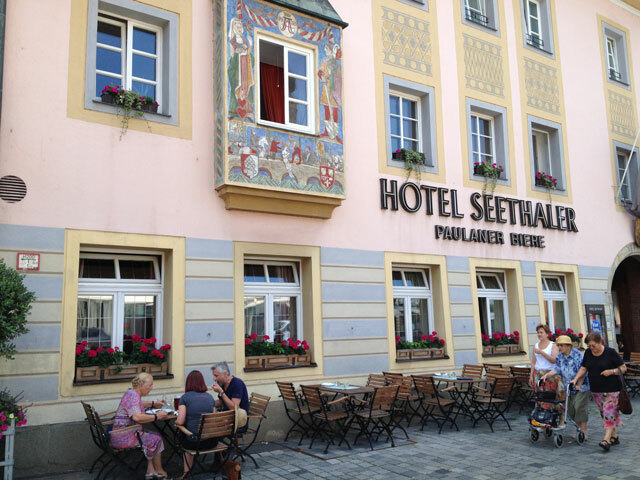 I can remember being bowled over the first time I came to Germany – and I still love it! I hope you have fully recovered from the shock of this experience. How scary! I’ve noticed there are many crossings around Europe without boom gates (I know there are some in Oz too) and it worries me as sometimes they look like abandoned tracks but really aren’t and I’m always nervous about crossing. Glad nothing bad happened! Sorry if you’ve already written about this and I missed it but how does the cycling thing work? Do you ride with your luggage or do you drive to your destination and then do a round trip around the countryside on your bikes? I can tell you that I have become super-careful of level crossings now! I intend to write a post about how we organise our cycling to make things clearer. No, we don’t take our luggage on the bikes for two reasons: one, it slows you down considerably and two, it restricts your freedom, particularly if the weather is bad or there are places you’d like to see that are too far from the bike route. We take the bikes on the back of the car and choose a central place where we stay for a few nights depending on the area. Three nights is usually ideal though we did spend longer in a couple of places.